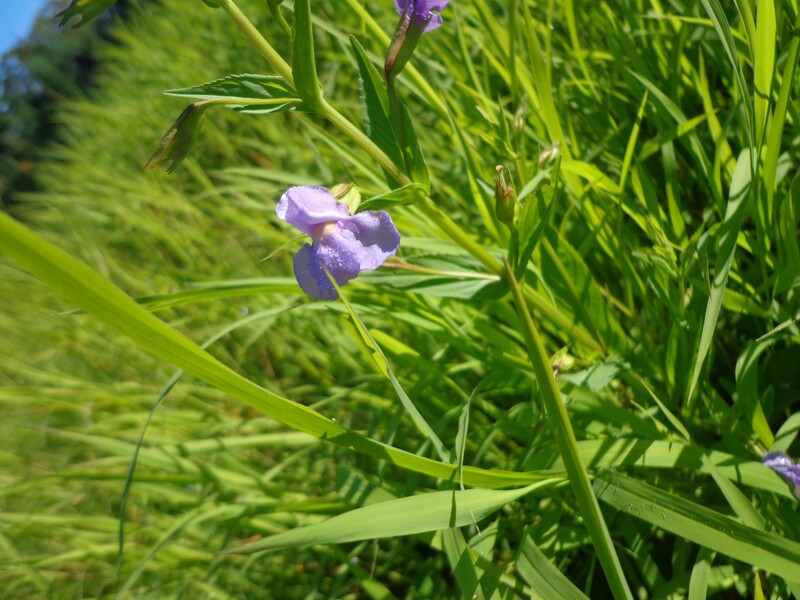 This pretty purple flower is a recently established plant on the banks of the farm pond. The seeds were probably carried there by wild birds. Following my new policy of identifying any unknown plants in case they are invasive pests, I looked this little beauty up. It is the Allegheny Monkey Flower, (Mimulus ringens) also written monkeyflower or monkey-flower. Presumably someone sees a monkey face when they look at the bloom. I actually don’t. But, I do see a very pretty and bright flower in an otherwise green landscape. The monkey flower has a square stem. It grows in wetland habitats, just above the water line where it is moist, but not inundated. I found three plants. Next year there will doubtless be more if they fruit successfully. The plant is native to New England. 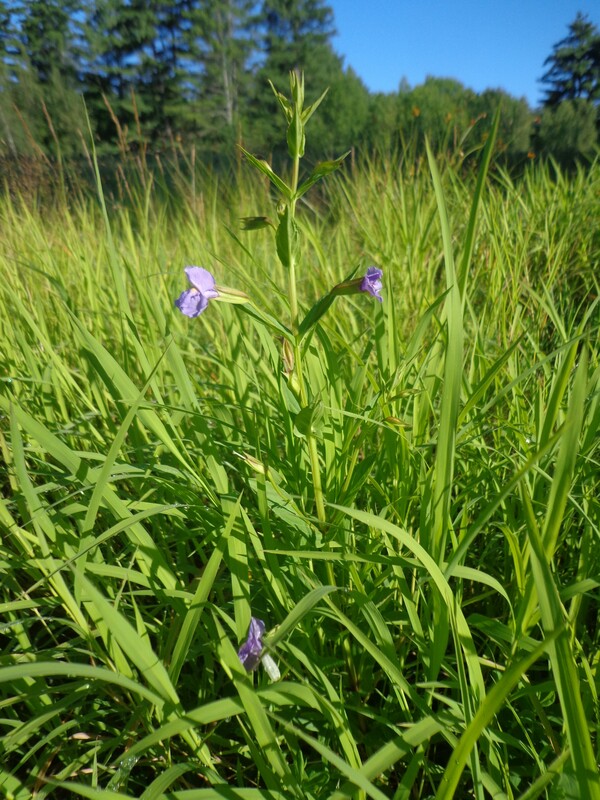 Where wetland has been disturbed and invasive purple loosestrife have taken hold, the monkey flower is out competed by loosestrife because pollinators tend to favor the invasive flowers. Happily for the monkey flower, there is no purple loosestrife allowed at our pond. Monkey flower blooms June-September. It forms seed pods that split open when ripe. The plant is a perennial of the Lopseed family. It acts as a host to larvae of the Baltimore Checkerspot and Common Buckeye butterflies. Overall, this wildflower seems innocuous, even beneficial. It surely adds beauty as the flowers are my favorite color. It may stay on our farm. This spring was a rough start for my garden. Right after I planted we had over a week of rain. Many of the seeds must have just rotted in the ground. I replanted the beans when only three sprouted and the second time got better results. Slugs ate every one of my lettuce sprouts during the rain and something will not leave my basil alone. Not sure if I will get any basil! The mystery peas are doing the best of all the garden veggies. The indian corn is also fairly happy with the frequent rain and hot days. Lia is about 46″ tall. The corn is well over her head and not tasseling yet. Lia has discovered the joy of eating raw peas right off the vine. 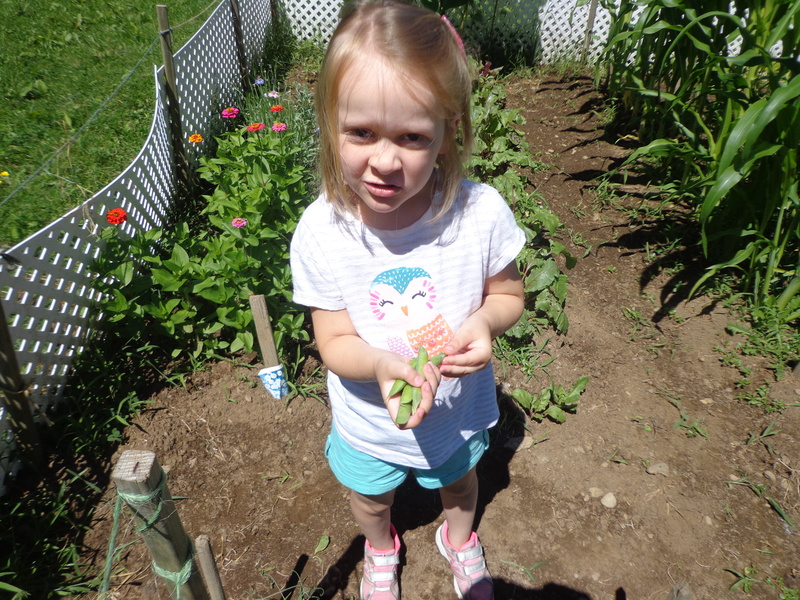 She is very proud of the peas she helped plant. Even the flowers I sowed in the garden did poorly this year. I have a few zinnias and bachelor buttons, but not as good as previous years. The rain was really hard on the seeds. Beets and carrots suffered similarly. 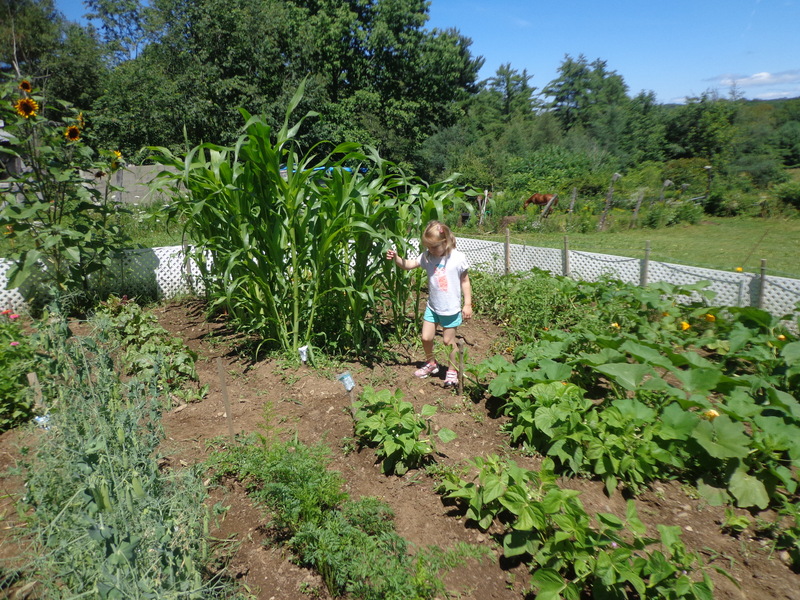 The tomatoes are producing a few yummy fruits and the pumpkins that managed to sprout are coming along well. The volunteers are all the sunflowers we have this year. Not a single seed came up and I planted nearly 20. Depressing. Yet, the weeds always do so well. 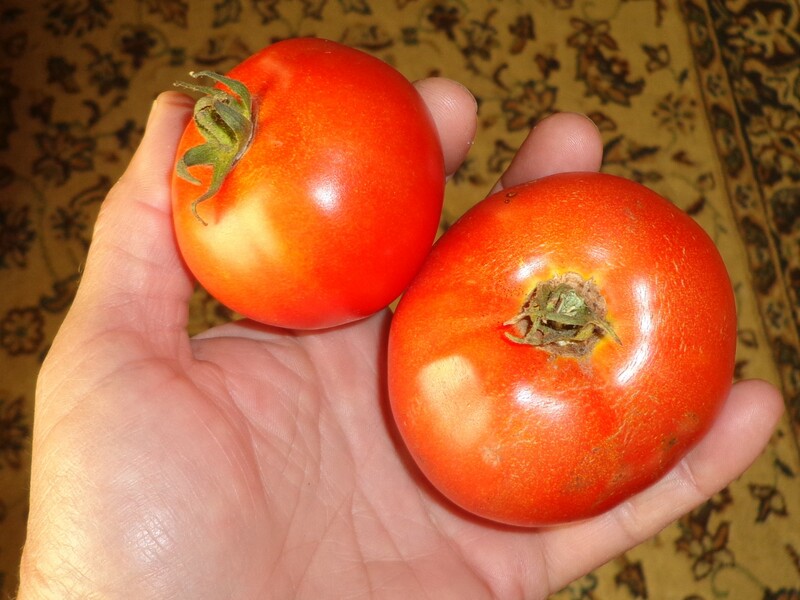 Here are my first Early Girl tomatoes. On a bright note, I saw a monarch butterfly on the 27th in the apple orchard when I was mowing. Perhaps people’s efforts to plant milkweed are paying off. This seems to be a good butterfly year, there are many varieties present in the gardens and on wild flowers. 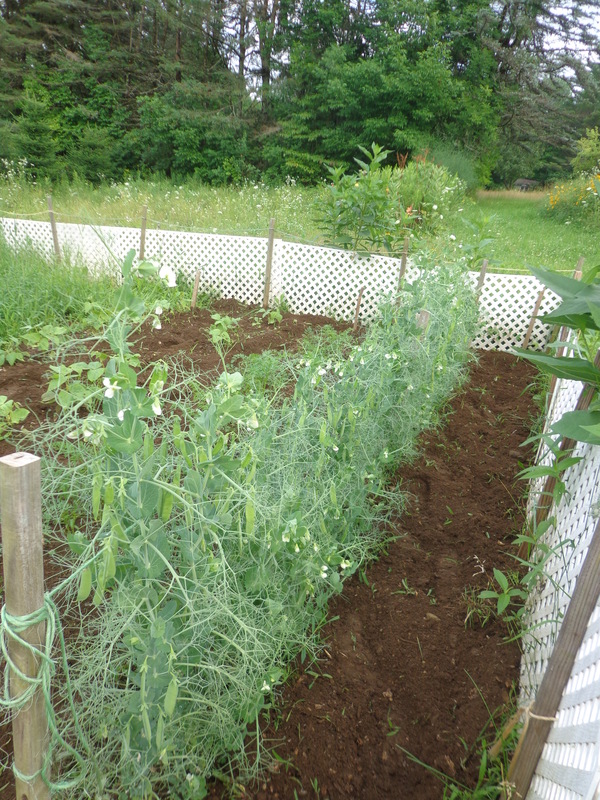 A few weeks ago I blogged about planting peas from a 5 lb bag of organic whole dried green peas that I purchased at the health food store last winter. I bought them to sprout for salad but didn’t really like the flavor of the sprouts. I’ve been rehydrating them and eating them like raw peas, which isn’t too bad. I also made mushy peas with them and that was good. So I decided to put some in the garden and see how the unknown, mystery peas developed. Well, I’m amazed! These are the strangest peas ever! They started out as normal sprouts, but then began sending out extraordinary amounts of tendrils. They didn’t make any leaves at all until they were almost a foot tall! Just huge amounts of tendrils. The poor things looked so desperate for something to grab on to that I ran strings on poles. They grappled on and kept reaching for the sun. In late June, these crazy peas started to bloom. They had lovely creamy-white flowers in profusion. Soon baby pea pods formed. Still the plants climbed and produced profusions of tendrils. I opened a couple half-ripe pods yesterday and the peas are delicious. The plants are covered with pods and still making flowers. I did a little research and discovered these are a new type of pea called hypertendril (good name!) They are a natural hybrid developed from a mutation called parsley peas. 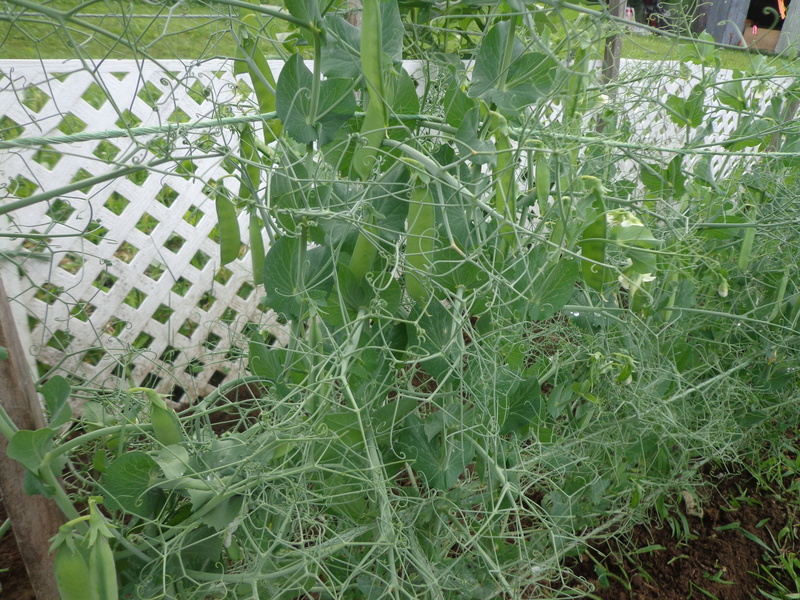 The benefits of the hypertendril mutation are, among others, the peas don’t require trellis support, they hold each other up, and the lack of leaves increases airflow to prevent mildew and other diseases. They are also heavy producers and easy to harvest. What a surprise for me! I had never heard of hypertendril peas. This variety is pretty amazing. 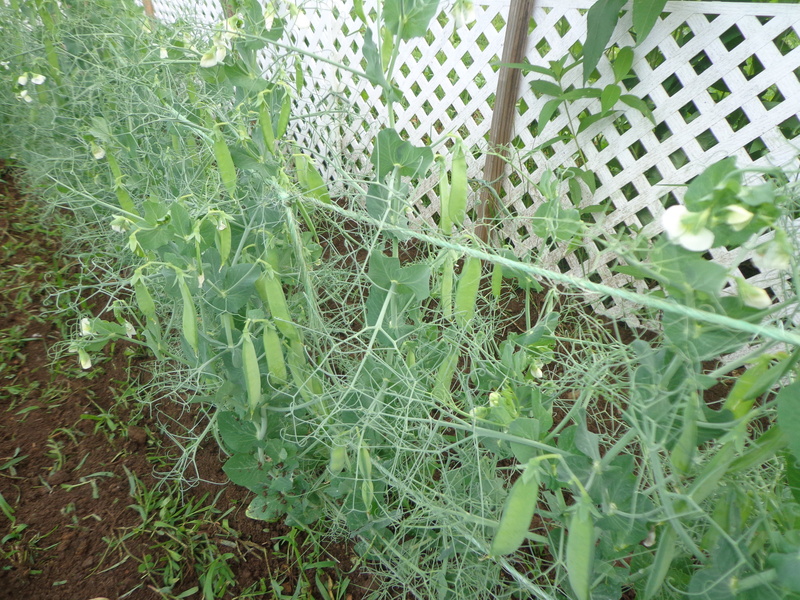 The minor support from the stakes and strings has made a wall of peas with pods hanging on both sides that are very easy to see and pick. But as a sprout pea, hypertenrils are certainly not the right choice since they have hardly any leaves. I serendipitously stumbled onto this type of pea and am glad of it. There is a variety of hypertendril called magnolia blossom that has gorgeous pink and purple flowers. Next year I’m going to try them in the garden. 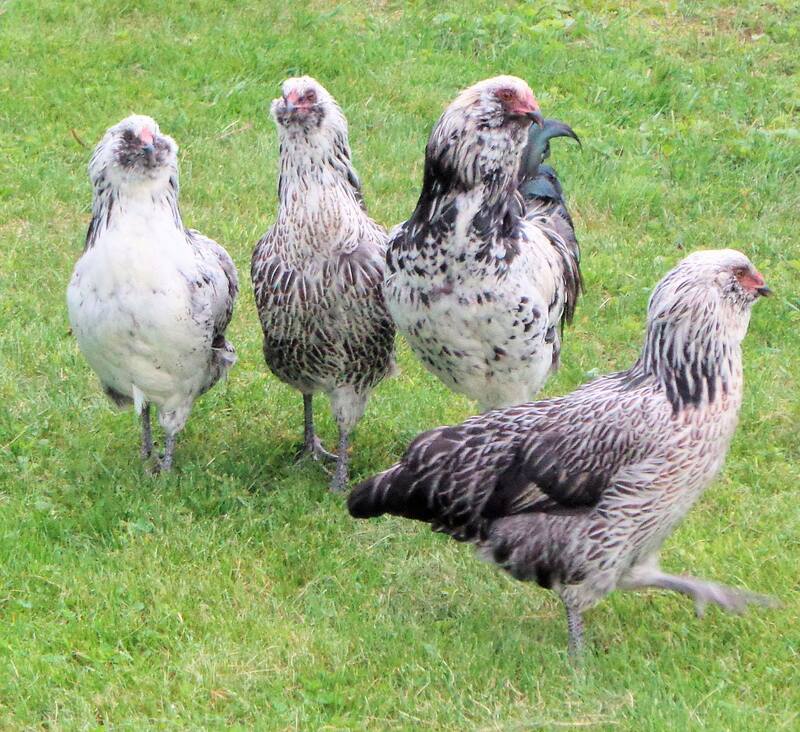 Here are some of the first eggs laid by my silver splash Ameraucana pullets from the Jan hatch. 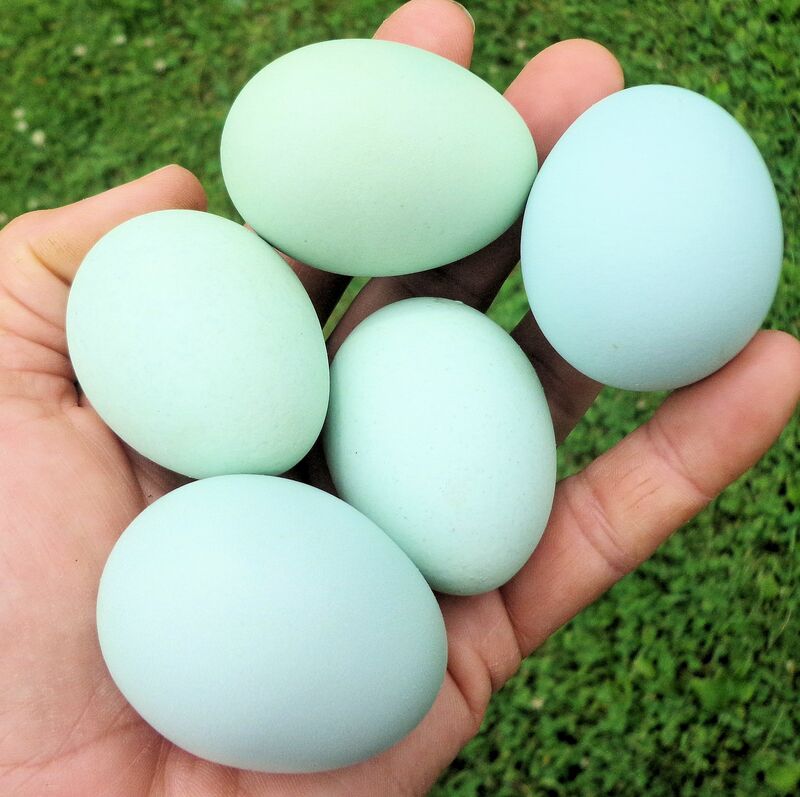 The baby eggs are always the best color. Some of the eggs look big, but this is just a trick of the camera. They are all small to medium grade sized eggs. I knew the young hens were ready to lay and have been trying to keep them in the pen during the morning to encourage laying in the nest boxes. So far they have deposited 4 or 5 on the floor. For the past few days I’ve been placing hens in nest boxes to show them where to lay. One hen in particular has found a way to escape the pen. She is always hanging around waiting to be let back in when I go out to do morning chores. Today I started to get suspicious about her early morning activities. Sure enough, after a long search through the hedges and bushes, I found her stolen nest. There were about two dozen baby eggs deposited there. I suspect she and her sisters have been using the nest. So today I will put a new net over the chicken pen to stop the birds from flying out and hiding their eggs. The pullet in the front of the photo below is the main culprit. Such naughty little birds!